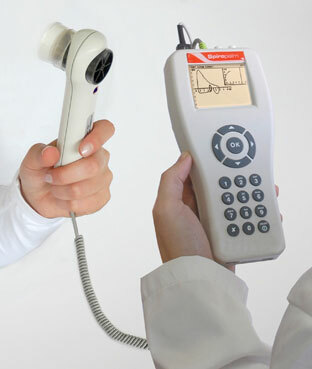 Spiropalm 6MWT is a new device that incorporates a spirometer with a pulse oximeter and ventilation monitor. During a 6 Minute Walk Test, this compact and lightweight combination can be easily worn by a patient on a harness or a belt to collect real-time data. The resulting report provides clinicians with a cohesive and comprehensive means of evaluating 6-MWT results. Reusable bidirectional digital turbine can be mounted on the face mask or a lightweight handset. The sensor is easily cleaned with a bleach solution or other disinfecting agent. 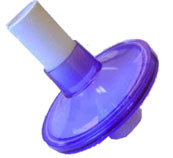 During spirometry, the operator can use their choice of anti bacterial/viral filter or mouthpiece. the ability to measure ventilation during exercise. 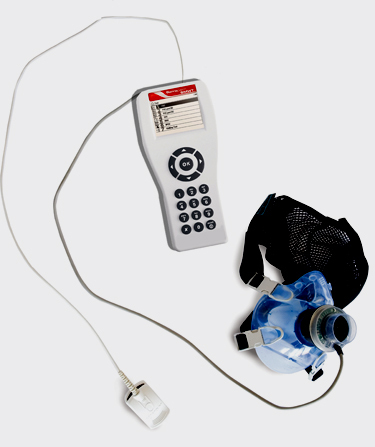 device during the walking test. on a Spiropalm USB flash-drive. Bronchial Challenge Testing - Methacholine, cold air, or exercise can be used to induce bronchospasm and to identify and treat asthma. Pediatric Incentive - "Bubbles" encourages patients to perform tests properly so you have optimal results quickly and easily. Quality Control Messages - Software-driven messages help the technician recognize testing errors and validate a maneuver's technical quality. 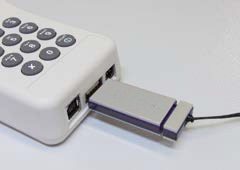 Alphanumeric Keyboard - Reports can be personalized with patient data, notes, and a header. Choice of Prediction Standards - Spiropalm is programmed with a choice of predicted normals, including NHANESIII, Knudson, ITS, Crapo, and other predicted sets. 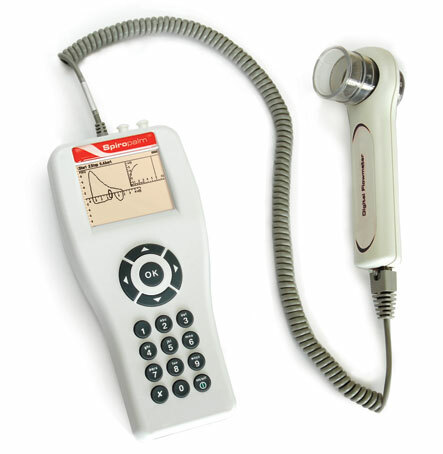 Economical - Cost effective way to perform diagnostic spirometry using your choice of mouthpiece or bacterial filter. Choice of Languages - Spiropalm is available in English, Spanish, French, Portugese, Italian, German, Dutch, Chinese (Mandarin), Korean, and Turkish. 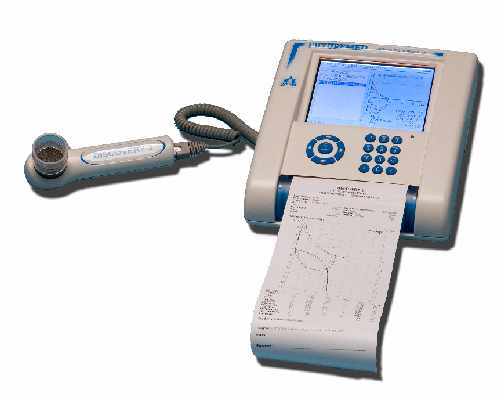 Accurate - Spiropalm meets or exceeds ATS standards for accuracy. Its unique sensor design is not affected by environmental changes. The built-in temperature sensor and the ability to make BTPS corrections ensure that measurements are exact for a wide range of flows, with low resistance.